I, too, turned down a traditional publishing offer last year because the advance was less than what I was making on the book over a one year period, and I didn't want to trade my annuity for life plus 75 years (full copyright) for an amount I expect to earn this year, and next. I don't expect to be earning that amount in 30 years, but even doing those calculations in the short term can be very eye opening! Thanks for posting this Mark. This is basically why I am such an evangelist for the indie business model - because you can be creative AND a business-person with this kind of attitude! I did a video when the penny dropped for me around fiction not aging as well, it was a life-changing moment! When you understand how assets can be income-earners for years, and how one manuscript can be turned into multiple streams of income, it is pretty amazing. Great way to look at it, thanks Mark. I have two author friends who took the publishing deal offered. Not only do they still have to work as hard as the rest of us to market their books, but it's clear they won't be making more than the advance. I'll stay indie, thank you very much! So what is the best way to pass this treasure on to my heirs? Assign them copyright on my death? Very good analysis Mark. One other factor that deserves weight is the speed of receipt of payments. Money that gets to you faster is worth more...and with the traditional model money collected from a customer can take a lot longer (sometimes significantly longer) to hit your account than in a self-published model. I agree totally with all you have said. However, all you have said gets blown away if your potential recurring income was zero or near zero. I would be so bold to assume that 95% of indie authors fall into this category. So you speak the truth for 5% of all indie authors. For the majority of indie authors, a potential upfront payment from a publisher can be rather attractive especially when they have been facing zero income and potentially zero future income. A discounted cash flow of zero income stream regardless of what weighted average cost of capital used is stil ZERO. I get it that an ebook is an asset capable of generating an annuity. 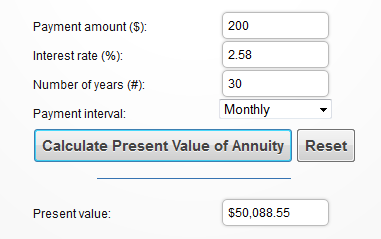 But the asset has zero present value if the annuity is potentially zero. So faced with a present offering by a publicist compared to a zero present value of an annuity, many indie authors might be tempted to sell out. However as for me, I prefer to retain my indie status for reasons other than the ones you have espoused in your blog. This is extremely valuable information. If more of my clients understood the value of their ebooks, they would be less desirous of a publishing contract with a print publisher and more willing to invest in ebook development and publishing. Changing their attitudes is oftentimes difficult, since many are set in their ways, but the math doesn't lie. On another point, it looks like you forgot a preposition in the seventh paragraph ("many high-quality print books are forced out [of] print too early"). I look forward to reading more insights from you in the near future! @ Jian. Thanks for these comments. I'm in full agreement. By analyzing the projected income stream of an indie ebook, the author is better prepared to make an intelligent decision when weighing an offer from a traditional publisher. And as you correctly mention, there are reasons to self publish that have nothing to do with money. The Indie Author Manifesto identifies many of these benefits such as faster time to market and total creative control. Thanks, Thomas. The missing preposition is now added!! "This is especially true for fiction writers since great stories are evergreen." I think you are right on the money. Quality stories will gain an audience eventually. The big problem for a new fiction writer in the current environment, however, remains visibility. The annuity may not bear fruit until some distant point in the future -- possibly after the author's death. The 'author 2.0' needs to be able to self promote almost as well as they can write (possibly more so). This in itself creates problems. Great post. I am familiar with annuities as I am living on the income from one now. I never thought of ebooks like that, but it makes perfect sense and gives me the incentive I needed to start thinking seriously about the manuscripts I'd like to publish myself. I also needed the info you gave Anna about the wills. Thank you for the great information. It helped me a lot.